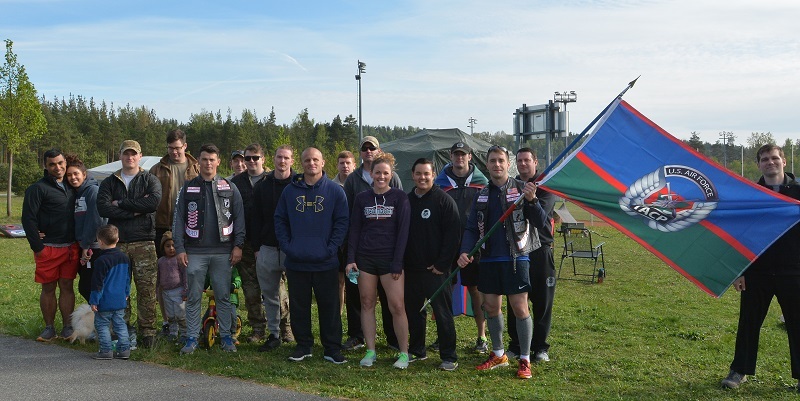 GRAFENWOEHR, Germany — Tactical Air Control Party Airmen from across Europe ran to memorialize fallen Airmen and Soldiers here, April 26 to 27, during the 7th Annual TACP 24-hour Run Challenge. “My goal is 60 miles. Last year I got 52 and I am trying to beat that,” said Senior Master Sgt. Jason Hammel, who set the bar high for this year’s challenge. The run started April 26 at 1 p.m. and continued through the night, ending April 27 at 1 p.m. The 2nd Air Support Operations Squadron, stationed in Vilseck received broad support from the U.S. Army’s 2nd Cavalry Regiment and 173rd Airborne Brigade, and TACP’s 2nd Expeditionary Air Support Operations Squadron out of Poland. The 4th Air Support Operations Group Detachment 1 from Ramstein also participated. Everyone was encouraged to participate, and bicycles and tricycles were available for kids. The Air Force Infantry, as the TACP teams are jokingly called, get their nickname from their primary task of providing air support to their assigned Army unit. Airmen assigned to this unit spend a majority of their career assigned to Army bases. The 24-hour Run Challenge is a worldwide event consisting of TACP teams participating globally at the same time. The Tactical Air Control Party is a relatively small community, consisting of roughly 2,500 members of the United States Air Force. Therefore, the event is very personal to many participants. Nine members have fallen since the beginning of Operation Enduring Freedom. The 24-hour Run Challenge will return next spring. Aside from building comradery and remembering the fallen, TACP uses the event as a fundraiser. The TACP association provides support and financial assistance to fallen and injured members and their families. This year’s 24-hour Challenge Run fundraiser has raised $107,500 so far and is aiming to raise a total of $150,000. Donations are accepted until May 1. For more information or to donate, visit tacpassociation.fundly.com/2018-24-hour-challenge.